As a child I was hooked to story books which eventually graduated to reading novels in my teens. The classics as they are called, I was often lost in thoughts on reading Jane Austen’s novels which were mostly set in a backdrop of classic, opulent English setting of the Victorian era. The emotionally powerful stories vividly spoke about English lifestyle and their culture. As a petite girl, these stories often left me mesmerized in fantasy. The stories had women carrying an unequivocal English dignity and austerity, replicating a sophisticated class that was explicitly an emblem of the elite British culture. Food often made masquerading appearances in these novels. Like the scenes where the English women walked in through the long corridors, sweeping their gowns as they passed by, the house maids poured in steaming hot tea from vintage kettles to tea cups held by their saucers and they sat by the fireplace in their lofty countryside mansions, overseeing acres of green pastures, speaking softly, elegantly, slowly sipping away their afternoon tea along with freshly baked cakes, warm scented scones and buttery biscuits. You bet, I’ve fancied being a part of this culture. I often loved the way life appeared over there, chic & classy, at least from the way it was depicted in these books, albeit a nostalgia for something I did not really know as a fact but only experienced through these books. More often I dreamt of taking a trip to the English countryside, sipping that afternoon cup of tea and taking luxurious bites into those warm scones and biscuits. I wonder at times what took me so long to bake these scones. Oddly, I’ve baked classic cakes and English teacakes on couple of occasions, but never made a start with scones. Glad I headed for a start and I loved the effort that went into making these. It was an afternoon that went fruitful in baking these scones and savouring them to our satisfaction. 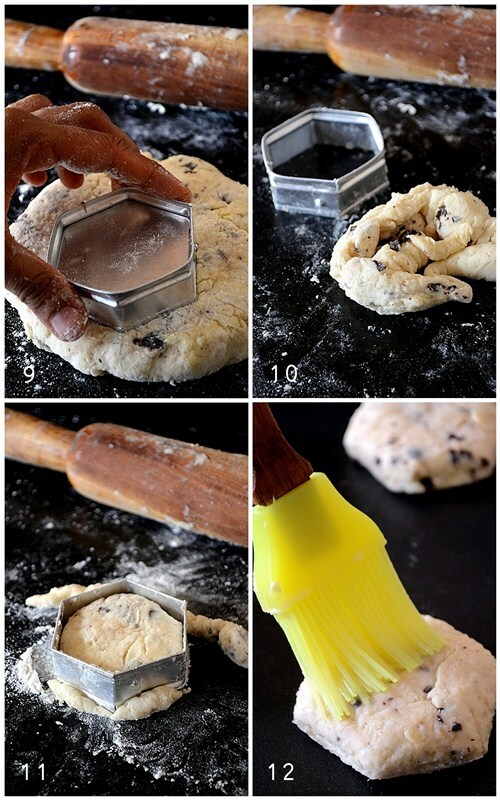 Here's another attempt at a step by step to help you with these Chocolate Chip Scones. Chilled butter, grated and cut into flour, baking powder, sugar and salt. Butter being rubbed into the flour mixture till it resembles coarse meal, similar to bread crumbs. Cream poured into flour, while chocolate chips being thrown in and dough brought together with light hands. Dough being rolled to form scones. Dough being cut out into scones using a biscuit cutter. Pressing the remaining scraps back together to form another piece. Brushing the scones with cream for that golden crust. Look at those oven baked beauties. Pass me those golden, light and creamy scones for my tea please! 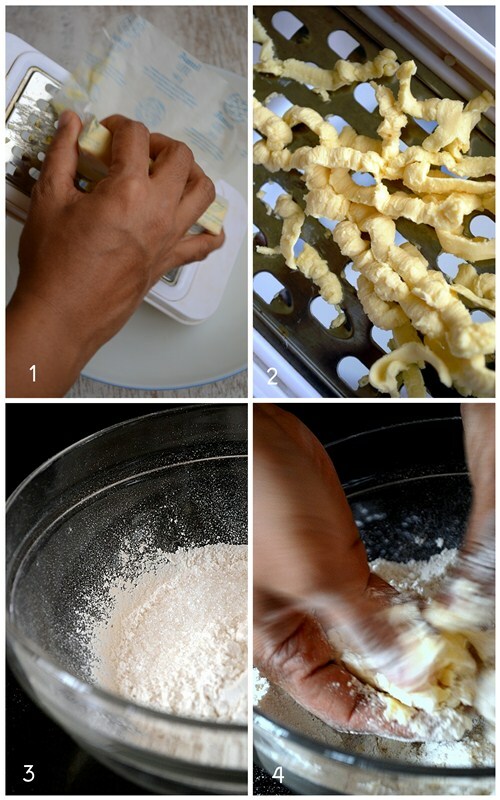 Place flour, baking powder, sugar and salt in a large mixing bowl and mix them well. Grate chilled butter into this mixture. Using your fingertips, rub butter into the flour mixture till it resembles coarse meal. A few larger butter lumps are totally fine. Stir in chocolate chips. Stir in heavy cream and mix gently using a fork until the dough begins to form. 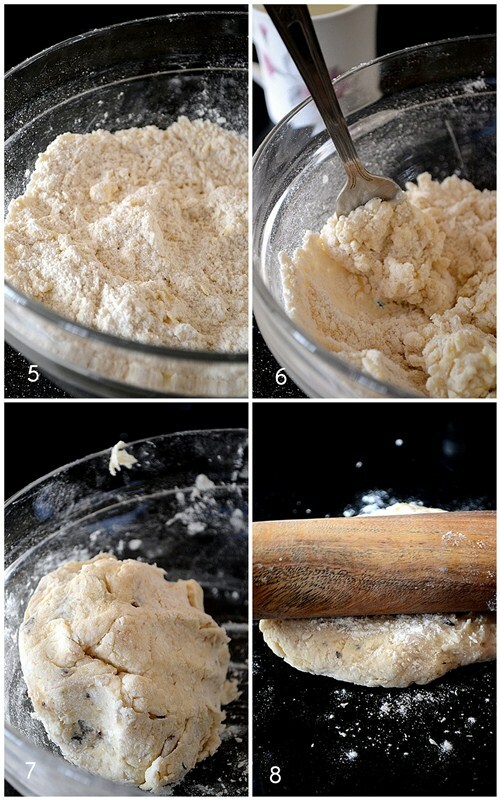 Transfer the dough and all dry, floury bits to countertop and knead just until it comes together into a sticky ball. Pat the dough onto a lightly floured work surface. Using a rolling pin, gently roll it into a 3/4-inch thick circle. Dip the biscuit cutter in flour and cut out scones. With light hands, press the remaining scraps back together to form another piece (like what I did) and cutting until dough has been used up. The scones that are made from the remaining scraps will be little denser compared to the others, but they taste fine. Brush the scones with cream or milk for golden crust. Do not knead or over mix the dough, else it will come out tough. Handle it with light hands. Lightly dipped the biscuit cutter in flour to cut scones from the dough. Don't twist the cutter, or the scones may not rise evenly. Place the scones side by side on a lined baking tray so that as they rise the sides will keep up straight and even as they cook. Finally, scones taste best served with some clotted cream and any fruit preserve. Serve them warm with tea for your evenings. The recipe here calls for a good dose of heavy cream, and perhaps could be the reason why they are good to taste! Undoubtedly, when you do bake things made of butter and heavy cream in them, the resulting bite would only melt in your mouth. Perfect and tempting,will surely try this. I'll happily start my day with this incredible scones. Oh man this is awesome....these pictures cant get any better....i like the snap of the grated butter..
Beautiful and delicious looking scones...Lovely clicks.. Check my First Event and giveaway. Would love to see them brighten my space for the event. Love the look of it...can't wait to make it. Just one query...Can Amul fresh cream be added to it? I've used a local brand, Milky Mist which is about 40% fat. Amul should work equally well and I don't see any reason why it should fail. Give a try and do let me know. Thank you, Mallika, for yet another delicious and easy recipe....baked these today using Milky Mist Cream and it was perfect! Only prob is getting unsalted butter..which brand do you use? I get only the salted ones here, Amul, and so avoid salt but still the result is too salty!